When Jerrod, Shandy and I met Andrew, we hadn’t slept through the night since bringing her home from the Humane Society. 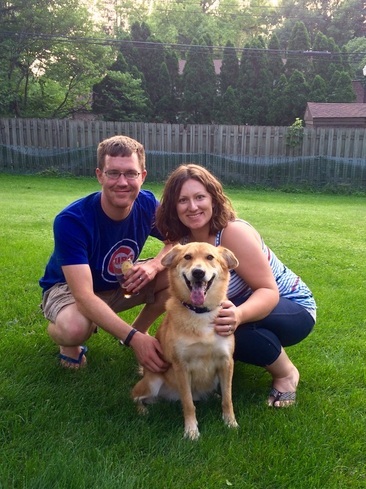 We knew Shandy was a sweet dog, but she was struggling to adjust to life at our home. She was anxious and we weren’t sure what else to try to help her adjust. We signed Shandy up for obedience class with Andrew, calling out that she had reactivity issues when we walked her around the neighborhood and we weren’t sure how she would do with a class full of other dogs. Andrew offered to meet her before the first class to help us out and get to know her and us. At that time, she had been home with us about three weeks and was having separation anxiety when we left her home. She was anxious and afraid in the middle of the night and kept everyone awake. She was also reactive to other dogs on leash, making walks and life in general very challenging. Andrew met the three of us and started at the very beginning, just observing Shandy and how we all interacted, which Jerrod and I appreciated. We could tell that his advice and training would be specific to our needs and not just general advice, a lot of which we had tried, but hadn’t had luck with up to that point. We learned how important routine was to Shandy’s life and how we could use food as a training tool every day. We learned how to hold the leash and how to interact with Shandy to increase her trust in us and ours in hers. Immediately, we instituted a routine of starting each day with a walk, started working with her on training to earn her meals and set boundaries and structure at home. Within weeks, she was able to gain free rein of the house while we were gone, sleep through the night (so were we!) and generally live a fuller, more balanced life. Over the next year and a half Andrew continued to help us coach Shandy as she made strides in confidence and abilities. He also helped us progress in our leash handling abilities, so she could join us more out in the world. His advice helped us to train Shandy to go running with us, as well as introduce her to several dogs that we saw often so she could learn how to play and interact. She was able to play with new dogs, as well as familiar dogs and make friends. We had several friends and family members remark that they thought she was like a different dog from when we first brought her home. Her biggest lingering issue was her leash reactivity to other dogs, which made it difficult to walk her in busy places and which we knew made her anxious and uncomfortable. When we were going to be out of town for two weeks, we decided it would be a great time to try Andrew’s Board and Train experience and help Shandy move forward in her leash reactivity. We didn’t expect miracles, but we were hoping we could cut her reactivity from where it was at that point, reacting to dogs about 75% of the time. She’s able to be off leash and enjoy the world in new and exciting ways, allowing her to live a much fuller, more fun life. We are absolutely thrilled with her progress during board and train. During the time we were away Andrew stayed in constant update with us about her progress, and we were excited to see she was doing great and even able to be off leash with no problems. When we picked up Shandy to go home at the end of the two weeks, Andrew was able to help teach both Jerrod and myself tools and skills to help Shandy trust us more, and help her cope when she started to get anxious in different situations. We learned our role in when she reacted to other dogs, and learned to how to better read her body language better to be able to help be her best advocate around new or strange situations, people and dogs. The board and train program came with a detailed report that helped us understand Shandy’s successes, what she learned and how we could keep that up in the future. Today, we still use those tools and they are still helpful. Shandy’s ability to run and walk even on crowded trails and in busy parks means we can take her with us almost anywhere. She’s able to be off leash and enjoy the world in new and exciting ways, allowing her to live a much fuller, more fun life. We love that she can go with us anywhere and we have the tools to succeed and help her be more comfortable.